“Hey, hey,” she shushes, as the cow fidgets. “Don’t worry, the cow and I will get off on the third floor and send the elevator down.” She smiles reassuringly. The door closes. I pull out bug spray from my handbag, stare at it for a moment, and then put it back in. Does bug spray work against bovine germs? I shake my head and suppress a grin. It is good to be back. Although I grew up in India—in Chennai, or Madras, as it was then called—I left for undergraduate studies in the U.S. and didn’t come back for close to twenty years. Returning to India was a long cherished dream. Living here is like being in a dream. Like encountering a cow in an elevator. Outside the apartment building, a large, red moving truck is parked near the curb. Two burly men are unloading cardboard boxes labeled “Crown Relocation.” My husband stands on the sidewalk, checking off boxes from the list he carries: bedroom, kitchen, toys, and so on. “You will never guess what I saw inside the elevator,” I say. Now he looks up, my husband. I glance at my husband. Before he says anything, before he protests, I turn and walk back into the building. I ride up the elevator to the third floor. Outside the apartment stands the slightly fidgety cow with the woman beside her. A woman in a beautiful sari comes forward. She is clearly the mistress, beaming with pride for her new home. The woman pauses and frowns slightly. I know what she is thinking. Will sharing the cow dilute the good luck that she hopes to accumulate? I don’t know my neighbor’s name but we are already sharing cows. Our sojourn in Bangalore is off to a swimming start. I nod at the milk woman. Her cow moos in response. Her name, I am told, is Sarala. The cow, too, has a name, but we haven’t yet been introduced. Can she come up to the fifth floor and parade the cow through my apartment as well? “Normally, they give me one thousand rupees [about fifteen dollars] for this, but since we are already here, you can pay us seven hundred,” Sarala says. We have a deal. I run up two flights of stairs while the cow and accomplice take the elevator. I feel that I ought to welcome the cow properly but there is little at hand in my empty apartment. I think about allowing it to lick my cellphone instead of a banana but decide against it. “Welcome to the cow,” I say formally as they come out of the elevator. My floor thankfully is not marble. It is red oxide and therefore rougher. The cow walks through my empty apartment, somewhat bemused and a little impatient. “That’s why I gave you the money,” I reply. “Yes, but cows can’t eat money,” she replies. “So why don’t you buy her some bananas with my money?” I have to ask. “Does the cow know the scent of my hands?” I can’t help myself. I am not sure if that is a good thing, but say nothing. “Help me push her into the elevator, will you?” Sarala asks. I nervously follow the lady and the cow to the elevator. She asks me to put my hand on the cow’s rear and gently push. “But what if she poops on me?” I ask. The elevator comes. I put both hands on the cow’s rear and push. “Don’t touch its tail,” Sarala says. The startled animal sort of jogs into the elevator. It does not poop. SHOBA NARAYAN is the author of The Milk Lady of Bangalore: An Unexpected Adventure. She writes about food, travel, and culture for Condé Nast Traveler, Financial Times, New York Times, Wall Street Journal, and Saveur. Her commentaries have aired on NPR’s “All Things Considered.” Narayan is also the author of Monsoon Diary: A Memoir with Recipes, which was a finalist for a James Beard Award, and her essay “The God of Small Feasts” won the James Beard Foundation’s MFK Fisher Distinguished Writing Award. 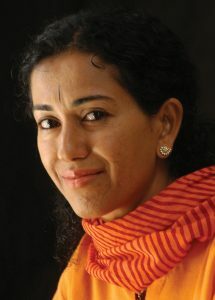 Visit shobanarayan.com. 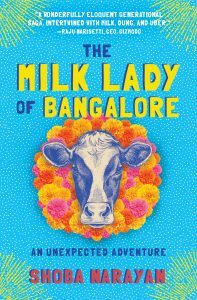 Excerpted from The Milk Lady of Bangalore: An Unexpected Adventure by Shoba Narayan © 2018 by Shoba Narayan. Reprinted by permission of Algonquin Books of Chapel Hill. All rights reserved.